Trumbo was a brilliant, highly paid screenwriter who was very successful. He happened to believe in communism particularly that wealth should be shared (although he was clearly much better off than most people). He identified with striking workers and in fact was not afraid to sympathize with many communist beliefs, which at the time made him the target of the House of Representatives Committee On Un-American Activities as were nine other screenwriters who were known as the Hollywood Ten. They were subpoenaed to Washington to go before the congressional committee. Members of the Committee forced them to identify themselves as communists, which they refused to do, and therefore were sent to jail on charges of contempt. This is just a small part of the story. When Trumbo comes out of prison this brilliant film writer couldn’t sell his scripts with his name on them anymore. Nevertheless he wrote many highly successful scripts under other names, two, of them winning Oscars. 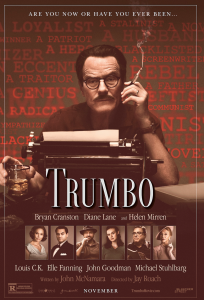 The fascinating life of Trumbo, his relationship to his wife Cleo (Diane Lane) and his children is the story of this movie. It involves the interactions with many Hollywood icons including Hedda Hopper (Helen Mirren), Edward G. Robinson (Michael Stuhlbarg), John Wayne (David James Elliott) and Louis B. Mayer (Richard Portnow). 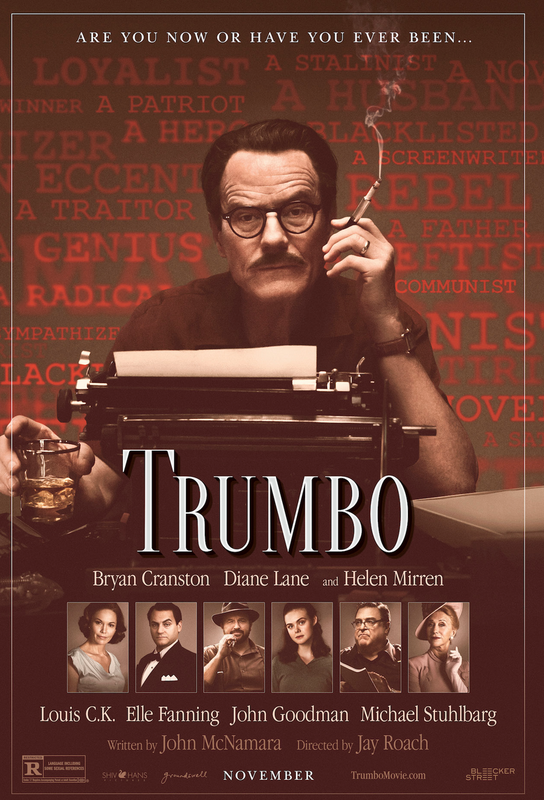 Also Trumbo’s relationship with another writer Arlen Hird (Louis C.K.) Is quite important as is that with Kirk Douglas (Dean O’Gorman) and Otto Preminger (Christian Berkel) in dramatic events at the conclusion of the movie.